Gratitude. Appreciation. Praise. Call it what you will; I dub it Thankful Thursday, a weekly pause to appreciate people, places & things. I am grateful for the sunny hour I spent with youngsters in the garden. Seashore Family Literacy's after-school programs are back in session and I am happy to be immersed in lively minds and tender hearts. Yesterday brought a glow of autumn sun and willing spirits. 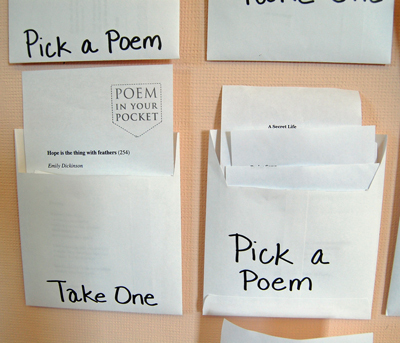 We began our session, as we often do, by picking poems from bulletin board pockets. Can we take more, they asked, more than one? As if poems were candy, we filled our hands and headed to the garden. Large rocks made for perfect poetry seats as we read to ourselves and to each other. Much to our delight, two girls chose the same poem: Praying by Mary Oliver. 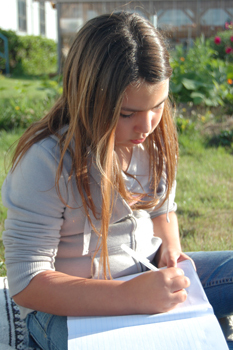 In the garden, in the light, as they stumbled over new words, the 9 and 10 year old voices floated like a song. Just as I thought the reverence could not increase, the youngest girl, in a small voice, said, I like the part where it says pay attention. We each agreed and wondered how we could pay attention to the world. With journals in hand, we explored the garden's bounty: expanding squash, heavy-headed dahlias, the scent of rosemary as we ran our fingers along what one writer described in her journal as, spiny green spikes reaching like hands. Another youngster, fueled by the beauty of bleeding hearts, wrote, If there were flowers in my heart I would water them every day with my tears. On this day, there were no tears. Only flowers to pick. Again, they asked: Can we take more? More than one? And with gratitude for poetry, gardens and young minds, I said yes.